Reverend Albert E. Lauer is the founder of Presentation Ministries. He was born July 19, 1947 and died October 13, 2002 at the age of 55. 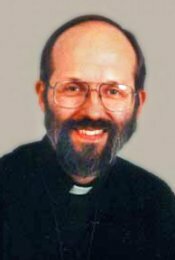 Originally a member of St. Ann Church in Hamilton, Ohio, he was ordained a Catholic priest for the Archdiocese of Cincinnati in 1974. His priestly ministry included several parochial assignments, hospital chaplaincy, prison ministry, and full-time national evangelization. In addition to founding Presentation Ministries, he also was the founder of a religious community, the Brothers and Fathers of Pentecost. distinguishing and promoting all vocations. A witness to gospel poverty. A champion of the unborn. We thank Fr. Al for his many years of devoted service to us and the Church.